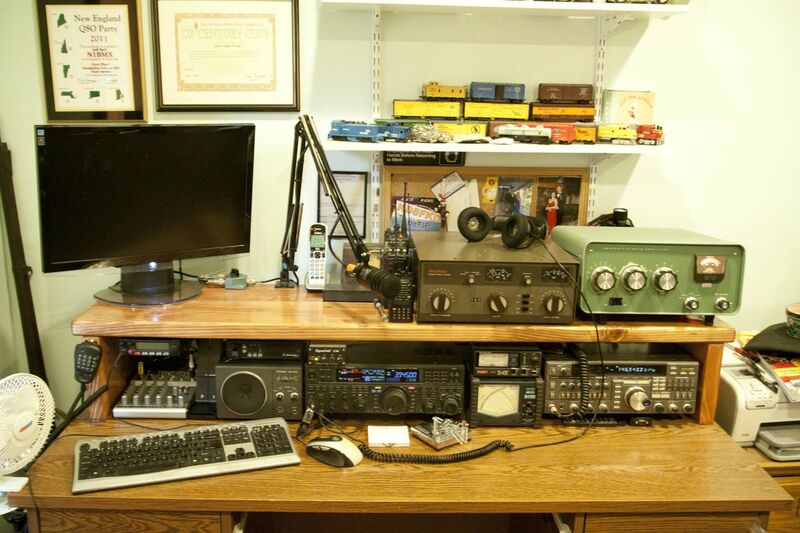 New changes in the Shack as well as on this Site. Things have been kind of slow since Field Day. I Don’t have the drive to pickup the microphone (or practice on the key). It doesn’t stop me from doing stuff in the background. I was looking at my station and was disgusted by how it was setup. I had equipment on top of equipment and a rat’s nest of wires behind my desk. I recently saw an Antenna Tuner” come up for sale on eBay that matched what I needed which consisted of having a variable inductor and that it can handle at least 1000 watts. It was also within the price range that I could afford so I took a chance. 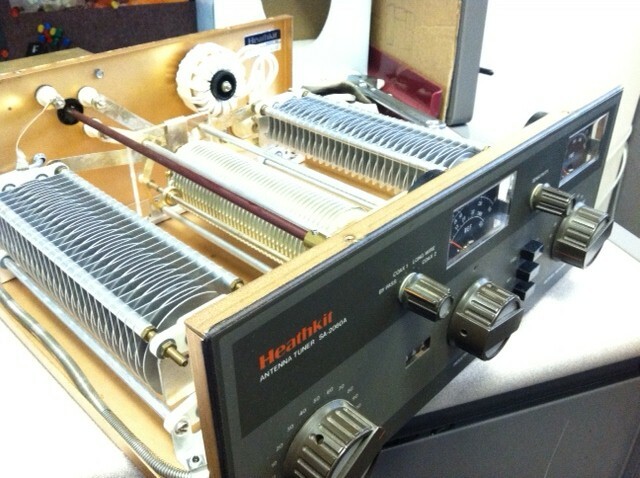 It was the Heathkit SA-2060A tuner. After reading review after review, I put this on my list of potential tuners. The only complaints I hear about this particular tuner is that the hardware becomes loose after use. Since they are kits when they were first sold, The build quality depends on the operator who built it. When I received the tuner, I opened it up and made sure everything was tight and soldered correctly. It appears that it’s in great shape and I did no work to it other than some light sanding using a fine scotch-brite pad. The reason I decided to get a tuner is because of my antenna(s). At the time I really have only one HF antenna which is my home-brew G5RV wire dipole antenna. Once you started getting away from 20 meters, the mis-matched antenna places a strain on my tubes that are located in the amplifier. The “tuner” should help that out. However I had no room for it. I didn’t want to stack the amplifier or anything else on it so I decided that I need to do something about my desk to keep everyone happy. I ended up fabricating a shelf that spans across the entire desk which would allow for me to put more stuff on my desk. I’m liking it better than the previous setup. The most important piece is right in the middle and a tiny bit easier to get to. Now I just have to clean the rest of the office. I am debating on placing advertising on this site. I am not a fan of advertisements and wanted to keep this site AD free but running this site isn’t free. It’s not much compared to other websites but any income I can get that would offset the costs would help greatly. I also might place ads on my YouTube videos. Not looking to make AMAZING profits but hopefully enough to cover the hosting. It might be something else but I recall you posting a picture of that somewhere. Hopefully that doesn’t happen with mine. I am only putting 500-800W into it so I’m not driving it that hard. I’ll be using the scotch this weekend trying to make QSOs in CQWW CW. I sort of ditched SSB to concentrate on CW. Have fun and thanks for looking! I have had the opportunity to see your blog and this stupendous my sincere congratulations, lots of information and especially high quality. But I have to also say that for those who have an amplifier SB-200 600w can perfectly use the settings I indicated and will make sure DX without any problems and with no audio quality very much the good, of course it all depends on individual taste, is more like Bass or Treble or enjoy Hi-Fi ESSB or not. Well because the settings I indicated there is little more to this style of modulation that I’m No. 1 fan, therefore rather like very much. Then of course you can always arise a problem of RF, but it can always visit this page http://www.cleanrf.com/, we have many good equipment for this purpose. I thank fellow Radio Amateurism as I am, all the information and research work have in your blog as it is very useful not only for me but for all those who visit, so once again congratulate and thank this initiative that is very well built and draws. With all hope that one day we can talk in frequency to the conhcer we a little better, it is clear that interest you. All the best and a lot of strength to do this exelente project information and research.